I must admit I don't know much about retreats. I've never been to one. I understand the word - to withdraw, to get away. The parents of a college friend often went on church connected retreats, but I was never precisely sure what that entailed. 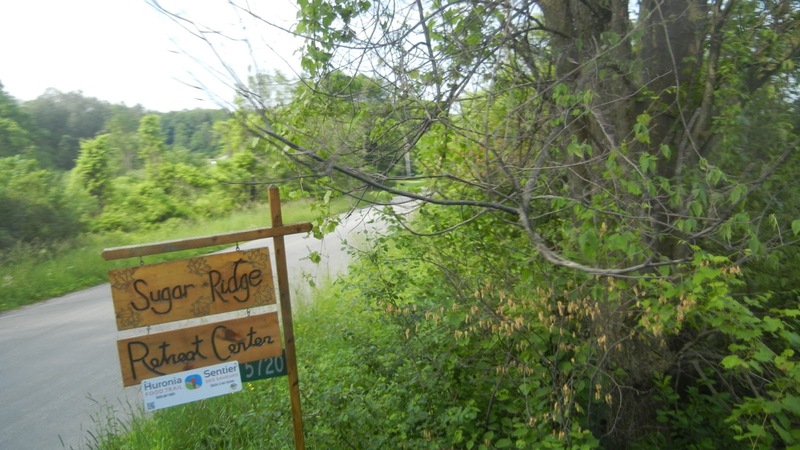 This week, I had the opportunity to take a little peek at retreat just outside of Wyebridge, the Sugar Ridge Retreat Centre at 5720 Forgets Rd. 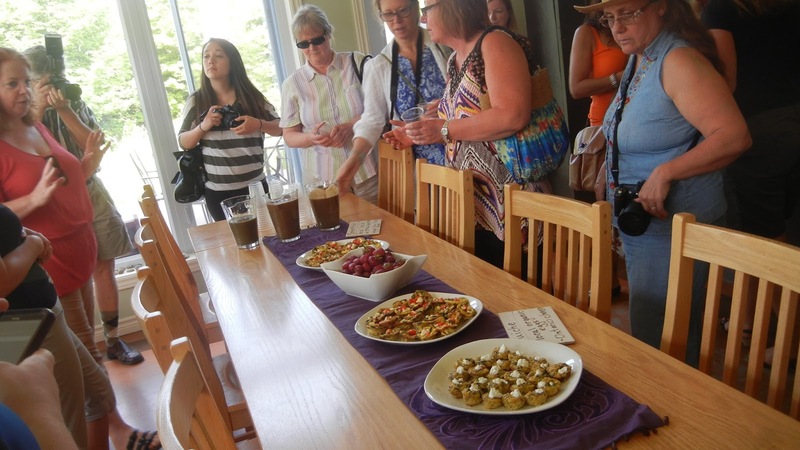 Sugar Ridge is stop number 1 on the newly minted, self guided Huronia Food Trail and it is just where we started on the media bus tour this past Monday morning. 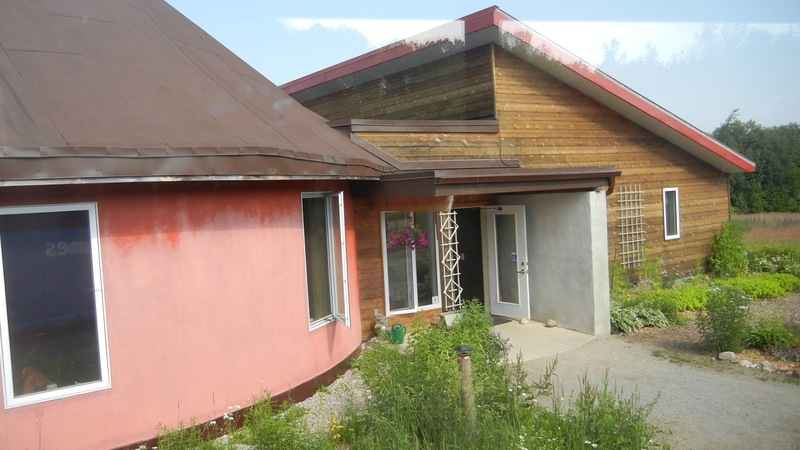 The retreat centre is short drive out of Midland, along some lovely rural roads dotted with some farms and houses, but mostly untouched, natural and green forested. Our coach bus driver, Steve, was at first unsure if he could get his big rig down the centre's laneway, but he made it and soon the woods opened up into a large open meadow with an unusually shaped building in the middle. The main building looks like two buildings joined together, one being a round yurt like structure and the other an angle roofed cottage perhaps. The windows of the round side were open to allow breezes in on this warm day, and as our bus passed in front, all I could see inside were bare feet up in the air! A yoga class was just beginning. Our group was met at the front door by our hostess, Liz Frost, a fit looking, curly haired nature's child of a woman, who seemed perfectly suited to represent peace and health in a setting like this. She welcomed us in and offered us a look at the yoga class, before showing us to the large airy dining area where goodies were already laid out for us. What do you do right before you eat? Wash your hands ... say grace? If you're a 'foodie', you take lots and lots of pictures! After an acceptable barrage of flashes and clicking shutters, the munching begins, with the odd hand drawn quickly back if an approaching camera lens is detected. Sugar Ridge offers organic vegetarian fare, which is exactly my thing, so I was excited to try the colourful food items on the table. 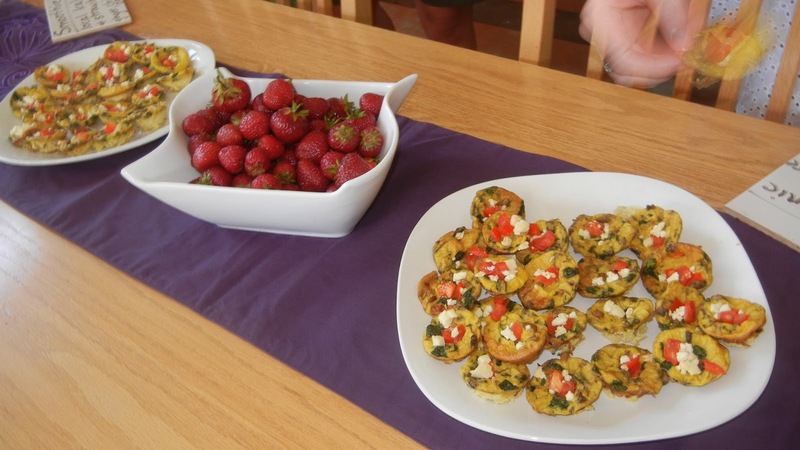 There were 3 platters with 2 kinds of veggie quiches, all made with local organic eggs and Ontario cheese. They were as good as they looked! I didn't inquire what kind of cheese it was, but it seemed feta like in flavour. Fresh picked strawberries were on offer too. At the end of the table, were jugs of what looked like chocolate milk but in reality were strawberry kale smoothies. Kale seems to be the latest super food lately, I notice. I wasn't too sure what to expect, but in the spirit of culinary adventure, I tried some and surprise, surprise it was pretty tasty! Liz offered to show us the interior of one of the little guest cabins that are scattered around the property, tucked into private little woodsy corners, some barely visible from the main building. Such cozy little places! With high ceilings, large screened windows and soft duvet covered beds, I can imagine falling asleep to the sound of crickets and the wind in the wildflowers - it must be heaven. I learned that they are partly insulated by straw which is cheap, easy to obtain, natural and very warm, even boasting an R35 insulation rating. 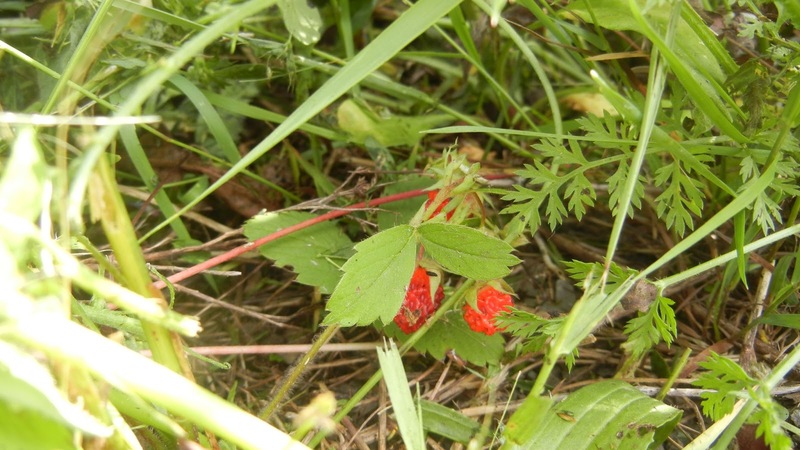 Walking back from the little cabin, I saw tiny wild strawberries along the path, just like the kind I used to gather as child. Back on the bus, I looked out the window and noticed that the entire meadow was a virtual airport of birds, butterflies and dragon flies arriving and departing from an endless variety native plants. There's nothing like an Ontario summer. The season is so short that every living thing, whether it has roots, wings or feet, bursts forth all at once and sings and blooms while it can. What a wonderful little place just to sit and experience it and just let the rest of the world fall away. I think I know what a retreat is now.